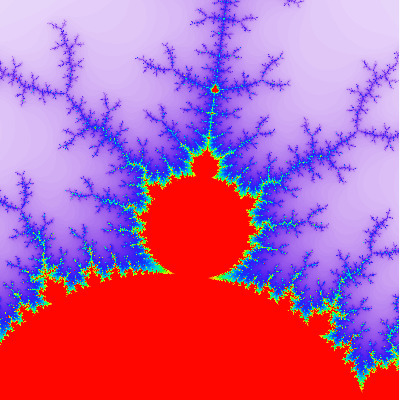 -d ... dimensions ... WxH of output; integers>0; default="400x400"
..................... blue cyan green1 yellow orange red"
PURPOSE: To create a mandelbrot fractal image. 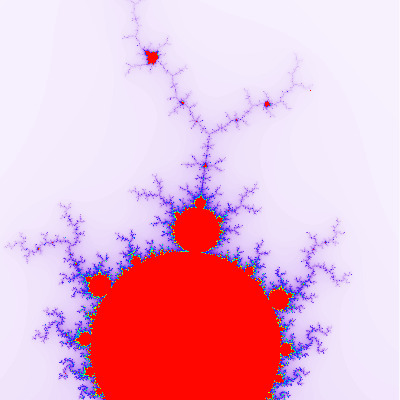 DESCRIPTION: MANDELBROT creates a mandelbrot set fractal image. 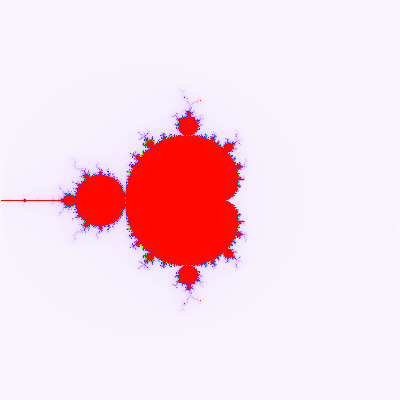 The fractal is defined in the complex plane by iterating the expression, z^2 + c, where z=(x+i*y), i=sqrt(-1) and c is a complex value that varies with x and y. The fractal may be zoomed in at any center coordinate within the WxH. The output image is colored by a color map according to the number of iterations needed to converge at each pixel. The background color (first color in the list) represents reaching the maximum number of iterations, which is 255. Otherwise, smaller number correspond more to the left in the color map and larger colors correspond to more to the right in the color map. -d dimensions ... DIMENSIONS are the width and height of the output image expressed as WxH. Values are integers>0. The default="400x400". -z zoom ... ZOOM value. Values are floats>0. The default=1 (nominal size). Larger values zoom in and smaller values zoom out. -m middle ... MIDDLE (center) location for the fractal pattern expressed as comma separated pair of integers, cx,cy, within the WxH. The default is W/2,H/2. -C colors ... COLORS is the list of space delimited colors that makes up the horizontal 1D color map. At least two colors must be provided. The default="white blueviolet blue cyan green1 yellow orange red". Any valid IM (opaque) colors are allowed. The colors will be interpolated to form a 1024x1 color lookup table image applied via -clut. NOTE: this script may be slow due to having to iterate up to 255 times at each pixels. Time run from a couple of seconds up to about 15 seconds for for a 400x400 sized image. The larger the zoom, the slower it will be.